Heart failure is on the rise, and fortunately medical advances continue to provide treatments and management strategies to improve quality of life. In this month’s E-News Exclusive, Today’s Dietitian (TD) discusses some of the new and updated recommendations for administering MNT from the Academy of Nutrition and Dietetics’ Evidence Analysis Library®. These new guidelines will help dietitians do their jobs better and improve patient care—which, of course is the ultimate goal. After reading the article, visit TD’s website at www.TodaysDietitian.com to read the digital edition of the February issue, which includes articles on sodium reduction, understanding orthorexia, embracing the term “natural,” and dispelling fish tales. Don’t forget to check out RDLounge.com where you can read and comment on blogs written by RDs for RDs on timely topics. We’re welcoming new guest bloggers, so if you’re interested in writing, please contact me at the e-mail listed below. Please enjoy the E-Newsletter and give us your feedback at TDeditor@gvpub.com, and don’t forget to like us on Facebook and follow us on Twitter. Bethany, age 55, began to experience shortness of breath over several months while performing her normal daily activities. She didn’t think much of it, until she started to notice swelling in her feet and ankles, and sometimes dizziness, lightheadedness, and a rapid heart rate. After visiting her primary care doctor, Bethany went to see a cardiologist, who ordered blood tests, an echocardiogram, and CT scan to examine the health of her heart. Much to her chagrin, Bethany, who still considers herself fairly young with many more years ahead of her, was diagnosed with heart failure—but she’s hardly alone. The number of people diagnosed with heart failure is increasing and projected to rise by 46% by 2030, resulting in more than 8 million people with heart failure, according to the American Heart Association’s 2017 Heart Disease and Stroke Statistics Update. In a new report, researchers at the Johns Hopkins Bloomberg School of Public Health’s Center for a Livable Future (CLF) detail the rationale behind replacing the term “food desert” with “healthy food priority areas.” The report, which was written in collaboration with the Baltimore Food Policy Initiative, also measures the state of healthful food availability in stores across Baltimore City, using a healthy food availability index (HFAI) tool that can serve as a valuable model for assessing community food environments across the United States. For some, the term “food desert” stirs up negative connotations, and it implies that low healthful food access is a naturally occurring phenomenon, rather than the result of underlying structural inequities. For others, the term connotes a pejorative status when some of these areas are home to vibrant communities with passionate and resilient residents and programs on the ground. Living in a “healthy food priority area” doesn’t necessarily mean people can’t access healthful food at all, as many people travel to shop for food, but it does indicate they may face more barriers—they may travel farther to reach healthful food outlets or may not have the economic means to afford healthful food options. Business Insider reports on US News and World Report’s annual rankings of the best diets, with the Mediterranean and DASH diets coming out on top. Long hiking trips can lead to hunger and nutrient insufficiencies; RDs provide tips for avoiding such situations in Backpacker magazine. We're interested in RDs' observations and comments on the generational differences in their clients' food and health perceptions. Please take a few minutes to provide us with your feedback. Your responses will be incorporated into an upcoming article. The questions are free response, so please share as much or as little information as you would like. Heart disease remains the number one killer in the United States for both men and women. February is a great month to encourage your clients to renew their commitment to heart-healthy habits. Learn about the role of inflammation, phytochemicals, and the microbiome in cancer prevention in this month’s issue of Today’s Dietitian. Read the CPE Monthly article, take the 10-question online test at CE.TodaysDietitian.com, and earn two CEUs! Buy One Heart Health Course, Get Another Course FREE! In this 1 CEU recorded webinar, which is Part 1 of a 4-Part webinar series, Shayna Komar, RD, LD, and Chef Nancy Waldeck provided recipes, tips, and ideas for RDs to use to guide their clients in using seasonal produce. If you missed the live version on January 31, 2018, don't worry! Register for this recorded version plus the remaining 3 parts at a discounted rate of $60 by adding all 4 webinars to your shopping cart and applying coupon code SEASONSMIX at checkout! Please note: this discount applies only to non-CE Club Members. Our Symposium Event Schedule is Now Available! 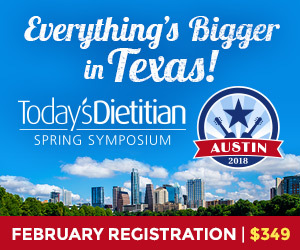 We are just three months away from our biggest and best event yet — our 5th annual Today's Dietitian Spring Symposium in Austin, Texas, May 20–23, 2018! Join us this May to earn more than 15 CPEUs by attending unique and timely sessions led by the best and brightest RDs in the field plus the chance to network with fellow dietetics professionals, attend special events, engage with our sponsors and enjoy product sampling. We expect to close registration by mid-March, so Register Now to secure your spot in Austin! Registration rate $349 through February! REGISTER NOW! Have a dietetics-related question that you'd like our expert Toby Amidor, MS, RD, CDN, to answer? Email TDeditor@gvpub.com or send a tweet to @tobyamidor, and we may feature your query! From messenger bags and tote bags to apparel and journals, the Today's Dietitian gift shop has the perfect gift for long-time professionals, recent grads, or even the RD-to-be. Check out our secure online shop today or call toll-free 877-809-1659 for easy and fast ordering. Have a product or service you want to market to dietitians and nutrition professionals or an open position that you need to fill quickly? Today’s Dietitian offers many flexible advertising programs designed to maximize your results. From print advertising to E-Newsletter sponsorships, website advertising to direct mail opportunities, Today’s Dietitian helps achieve your goals. Email our experienced account executives today for more information or call 800-278-4400! Coming up in our March issue is our Nutrition Showcase. Email a sales representative to be part of this unique advertising opportunity. AlliedHealthCareers.com is the premier online resource to recruit nutrition professionals. Post your open positions, view résumés, and showcase your facility's offerings all at AlliedHealthCareers.com!